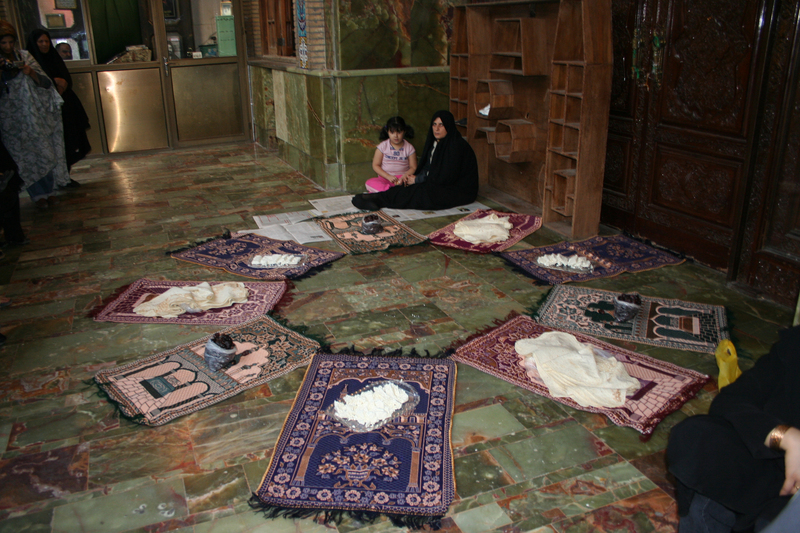 This installation titled “Prayer Rug,” involved nine prayer rugs, on top of which a traditional Persian meal was served. Installed on sight at Imam Zadeh Saleh, elements of this worked echoed in a collaborative creation titled “Permutations of Three” set in similar formation during December 2003. 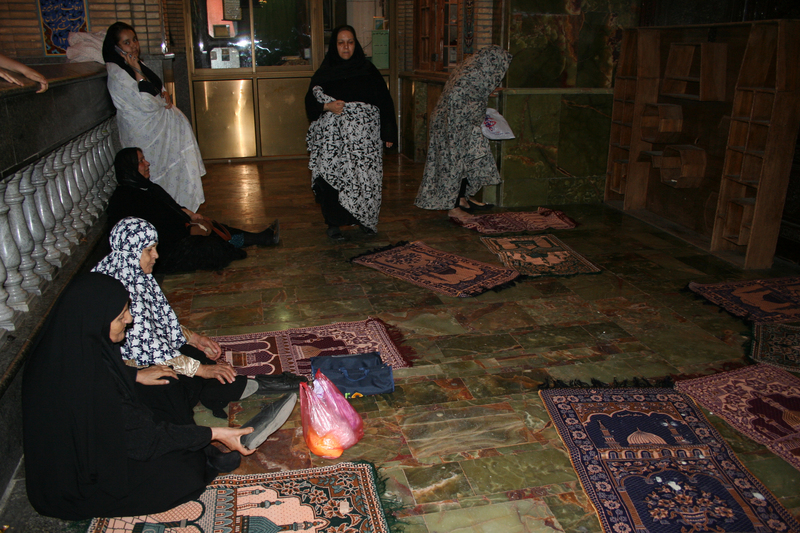 Upon my arrival at Imam Zadeh Saleh, in 2002, I was greeted with curious faces. 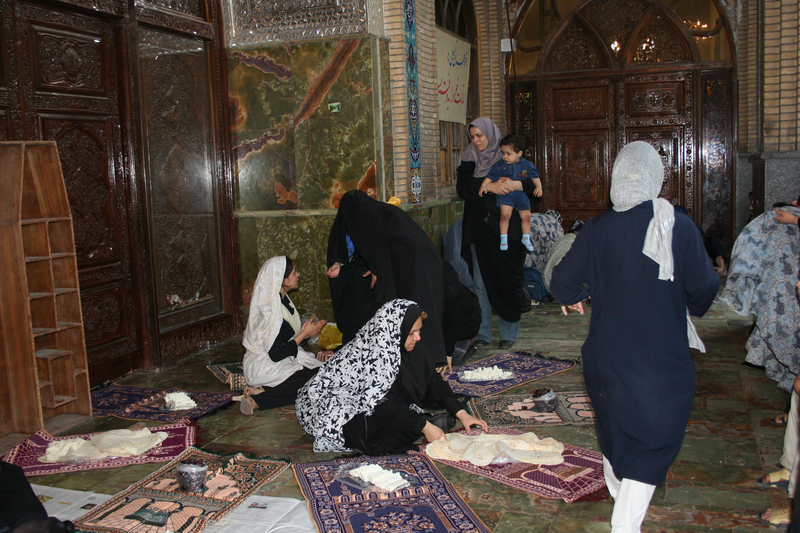 I sat down on the marble floor, and began to unpack prayer rugs and food when one of the women watching me came over and, without uttering a single word, began to help me pass the food to spectators. As the food dissipated, I left the installation to take photos of the mosque at call of prayer. When I returned, I found the prayer rugs moved out of formation. Rearranged to point towards Mecca, the prayer rugs had transformed from my initial sculptural plan, to their original purpose as objects. In this experience I found that losing control over the eventual interpretation of my installation allowed the work to become vulnerable to outside influences, thus providing a moment of clarity, reflection, and interruption not just for the viewers, but also my self. In 2002, I was invited to work with The Hammer Museum, again. I was so excited. This time we were paired with Artist Dorit Cypis. Who was running the workshops with the Hammer Museum youth group Artists. 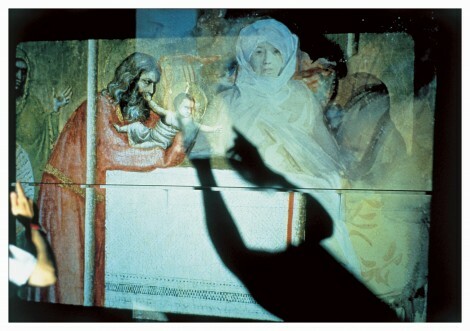 We were able to bring in images, make collages, and perform in front of projectors. Where as the collaboration with the Tibetan Monks was all about setting aside our egos and creating magic from sand that was ephemeral. In this project we were center stage. Our group began with over 30 young artist and on the day of the final presentation only three of us, fought through our personal insecurities and showed up. I remember being made fun of, by those who quit, for being excited about the project. I was delighted to participate then, and continue to cherish those memories today!